December 16, 1944. In the frozen forests of the Ardennes, a surprise attack by the German army on American Allied forces launched the long, hard slog that was the Battle of the Bulge. Sir Winston Churchill called it "the greatest American battle of the war and . . . an ever-famous American victory." In clear and accessible prose, World War II historian, Pulitzer Prize winner, and New York Times-bestselling author Rick Atkinson skillfully navigates the attacks, counterattacks, advances, and retreats of this terrible bloodbath. Whether history buffs or newcomers to the topic, young readers will appreciate the many fascinating facts, photographs, and statistics included in this book, and thrill in this real-life account of victory against all odds. 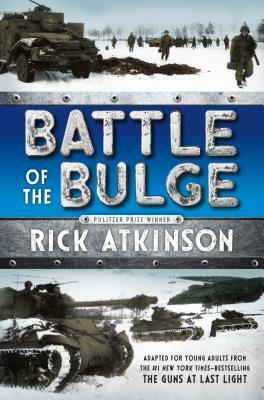 Rick Atkinson is the bestselling author of An Army at Dawn (winner of the Pulitzer Prize for history), The Day of Battle, The Long Gray Line, In the Company of Soldiers, and Crusade. His many other awards include two Pulitzer Prizes for journalism, the George Polk Award, and the Pritzker Military Library Literature Award. A former staff writer and senior editor at The Washington Post, he lives in Washington, D.C.